Hello, everyone! Due to the recent release of /warp stock, and the growing interest in stocks the last 5 minutes has shown, and the intense questions getting asked, I have decided to make a guide on the plugin. Here you will find out many different things, like HOW a stock works, WHAT a stock is, and HOW it relates to your in game experience! I have also included some FAQ's that should help you have a smooth experience working with the plugin. This means: By buying a stock, you are literally buying a PART of the company from whom you are purchasing the stock. Say I buy a stock from Amazon: This means I am purchasing a part of Amazon's company. I pay a certain amount to buy this share in the company, and by doing this, I will earn/lose based on the company and how well it does. If amazon has a sudden drop in its income/profits, the stock value of a single stock could drop. If it does well, the value of the stock may rise. The stock plugin mimics real life stocks. This means, if amazon stock is doing well in real life, it will make you money in game, should you decide to sell your stocks. "How do I find the stock's symbol, and what is a stock's symbol?" --- You can look up the stocks name online by typing in "what is the stock symbol for (company name)"
You also want to make sure to look at a larger scale view of the graph of the stock's value- a stock can drop percents in one hour, but gain them back in the next hour. 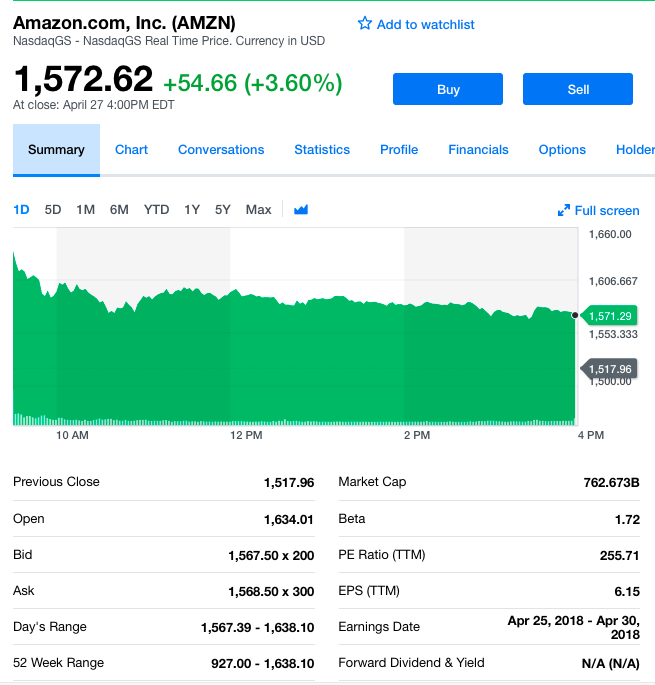 In the picture above, the graph of amazon shows the hourly trends- make sure to look at monthly, yearly, or 5 years to see how well the stock actually does. "Oh, no! My stock just dropped 5%! What do I do now?" --- Don't sweat if your stock drops even up to 5% in an hour, stocks fluctuate a ton. Amazon, which is what I currently own, can drop up to 5% at certain low points in the day. "How often are stocks updated on the server?" --- It seems stocks are updated every ten minutes. "Can I give shares of a stock to my friend?" --- Sadly, no, there is no command to do this, but you can always help someone If they need it. Always remember to BUY LOW, SELL HIGH, with stocks. This means buy when a company's value is lower, and sell when you have made more money. If your stocks keep dropping, you can always make the decision to sell them, even if you lose some money. Thank you! Seems great and helpful! I love it helps a ton! So it is for real life companies, not in game companies? Yes, the stock market mimics the irl market, meaning you can invest/buy any publicly traded stock. There are no in game stocks, but if you own a company, you can invest in its real life value. You get the symbol, price and statistics of the company. Really helpfull to see if you should invest or not. Maybe for the new players leave a sign there telling there is a guide on the forums before they randomly spend all their money on stocks? you can buy stocks yourself. They change in value overtime. They are based on real time stocks. But they are not a good source of income if you don't really undertstand how it works, first invest smaller amounts to practice .